The fate of the 33 miners trapped underground for 69 days by the collapse of a gold and copper mine in Chile’s Atacama desert proved a nail-biting, heart-tugging true-life tale of resilience and courage when it unfolded across the world’s media in 2010. 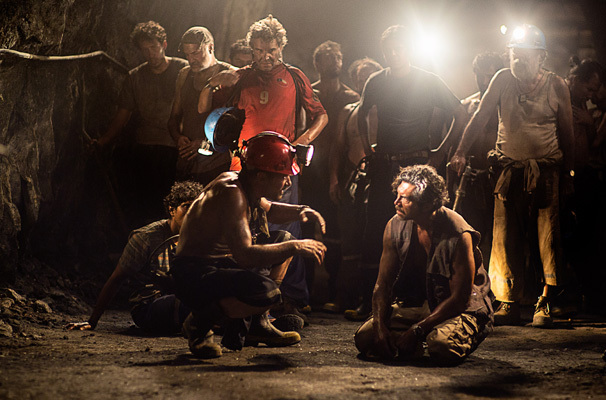 Retold for the cinema screen as The 33, the men’s ordeal remains powerfully affecting, although there are long stretches when it is touch and go whether their story will end up buried beneath a mountain of Hollywood cheese and cliché. The first unsettling tremor comes as soon as the film’s characters open their mouths. A mix of Hispanic and non-Hispanic actors, led by Antonio Banderas, Lou Diamond Phillips, Juliette Binoche and Gabriel Byrne, the cast all speak in English, which can’t help but jar with the otherwise authentic-looking setting (much of the film was shot a few miles from where the catastrophe took place). Additional wobbles come when the filmmakers unnecessarily try to pep up the action above ground, hinting for example at a flirtatious rapport between Chile’s handsome Minister of Mining, played by Rodrigo Santoro, and the feisty sister of one of the miners, awkwardly incarnated by Binoche. The 33 is on much surer footing when it goes underground, with Banderas in particular delivering a performance of unbuttoned vitality and charisma as Mario Sepúlveda, the natural-born leader who keeps the men going with the sheer force of his personality. And, as the rescue attempts hit snags and setbacks, the miners’ fate becomes increasingly gripping, for all that we know the outcome. Yes, the film is seamed with flaws, but it’s hard not to well up when we get to the end.